Createscape Coworking is wrapping up a new expansion at the Tillery Building as we add exciting new spaces, desks, and coworking for the community. We have signed a new lease on an additional suite, allowing us to grow at our current location and we have been hard at work since the summer planning out how to best design the new areas and undergo renovations. A survey sent to members also helped inform some of our decision-making for features of the coworking space that everyone would most appreciate and make use of. We added a new private office (bringing our total to 3) and have been debuting new spaces every couple weeks. This fall we have been moving along with our updates, which we now wanted to share with all our friends and subscribers. The new Createscape kitchen and break room opened mid-October already as an inviting gathering space designated for members and day pass users to be able to prepare and eat meals and socialize. The kitchen is a great overall size, has plenty of counter top space, has a full-size refrigerator, two sinks, pantry, cabinets, a coffee station, dishwasher, microwave and toaster oven, filtered water cooler, a television, a farmhouse table for communal seating, and counter seating. As an additional private space to the Conference Room, the Studio Space is a new addition that is one-part photo/video studio and one-part meeting room. For meetings, it is equipped with a table, whiteboard, Wifi, TV/display, HDMI connections, Apple TV, Google Chromecast, and seating for up to 6 people. For small photo and video shoots, the room is modular to allow everything to be cleared easily and it has seamless paper backdrops (white, gray, and black for now) against a 9-ft wall in addition to a simple, built-in 3-point lighting setup. 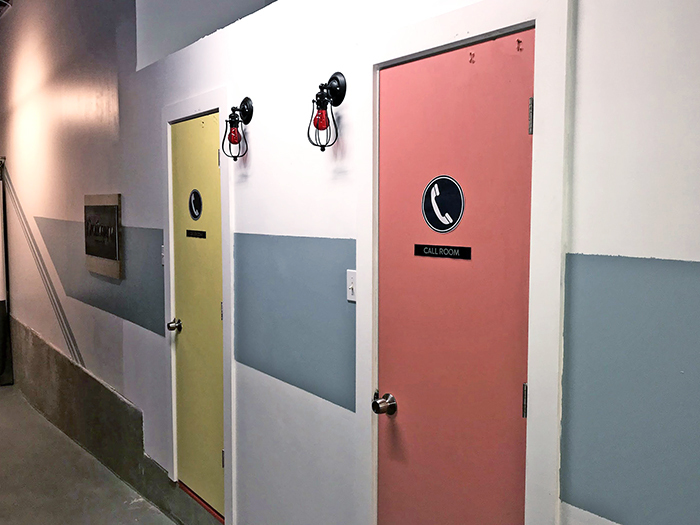 We have added two new call rooms to the east wing of the office that are perfect for some privacy while on phone calls and video calls. Equipped with a desk, stool, and outlets, they are cozy spots with a red light bulb outside each one to indicate their availability or use. Our other two call rooms will soon be upgraded and available for reserved use, allowing for bookings similar to our meeting spaces. The East Wing of the space will soon become the main hub of the office so that the parking lot-side door will be a new, inviting "main entrance" to the space. 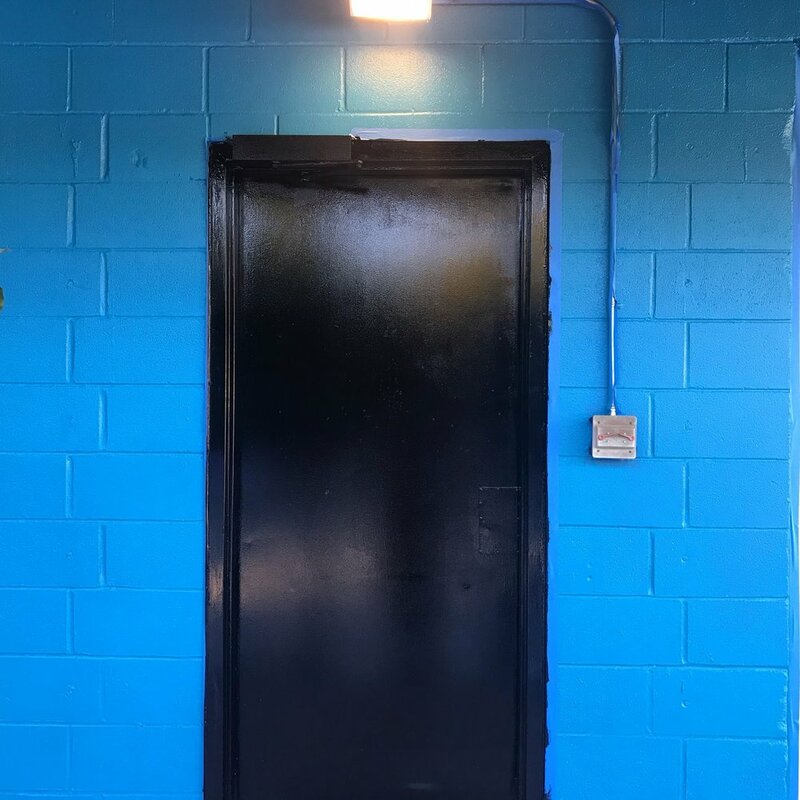 There will be an administrative/reception-style area to the left when walking in and we will be centralizing our member assistance efforts and availability there. The main room of the new A-12 suite will be our biggest single space of the office with a beautiful new design and plenty of custom-designed booths for all members to work at, have meetings at, or collaborate with others at. The covered patio is connected to this room and is being renovated as a great outdoor seating space for all members to use and enjoy. The new room will also feature 5 total "Office Pods", designed as mini, semi-private offices (setups available for one or two desks). These Office Pods will be a cross between a designated desk, cubicle, and private office and will be kept at an affordable price for individuals or small teams to have their own space to themselves while still being a part of the larger coworking community here. More information, photos, and specs will be made available soon. These will be available starting in December. Wait List. The new room will feature at least 10 new Designated Desks. Since we have been at full capacity with this membership option since the Spring, this will allow more people to take advantage of having a personal workspace at a good price. These will be available starting in December. Wait List.